Each year, 4 million tons of wrapping paper and gift bags end up in the landfill. That is enough paper to cover 45,000 football fields. This holiday season, instead of adding to all the waste, why not be part of the solution? Envirosax come in many colors and patterns to suit all of your gift recipients. Aim to wrap at least 3 presents in Envirosax this year. If each family did this, we would keep 13,500,000 feet of waste out of the garbage! The bag itself becomes an extra gift that will surely get lots of use. Kerrie, our owner here at Nourishing World once found herself on a family vacation with too many souvenirs to fit in her suitcase. Fortunately, she had a couple of Envirosax stashed in her purse, and was able to pack one as her carry-on for the flight home. Envirosax, and Omnisax by Envirosax, are stylish, lightweight, waterproof, and fold up small. Each bag has the potential to replace a whopping 5,000 plastic bags during its lifetime! These cloth bags are not just great gift wrap; they are also a perfect stand-alone gift that will get constant use. Every time someone bags their groceries with Envirosax, they are taking several plastic or paper bags out of production, saving trees or petroleum, and keeping bags out of the landfill. This truly is the gift that keeps on giving — to the planet! They are a great carry-all and even cute enough to use as a purse! 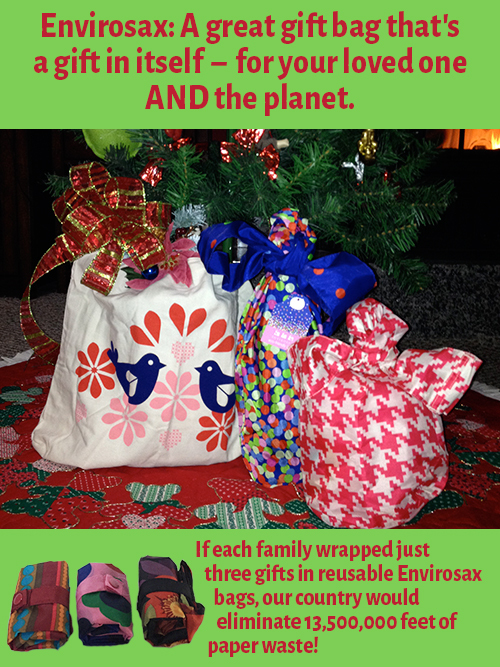 Add an Envirosax to Christmas stockings, give it alone, or use it in place of wrapping paper or disposable gift bags. Check out this video to learn how to wrap gifts in Envirosax! Save 10% off your order of 3 or more Envirosax! Just use coupon code EcoWrap at checkout. Sale ends 12/31/14. ← A Better Way to Drink Coffee?